In good and bad economies, layoffs happen. And when rumors of layoffs arise your otherwise pleasant coworkers can turn to backstabbing and other petty behavior to make themselves look good. But even though your office environment may begin to feel intolerable and push you to the edge of panic, by being proactive, positive, and making the best of your professional relationships you can make it easier to find new employment and even improve the likelihood of keeping your current position. The first step to making the best of a bad situation is to be prepared. This doesn’t mean selling your house and moving into your car, but it does mean you need to seriously think about what you will do in the case that your employer does terminate your job. A big part of this process is updating your professional social profiles, your resume, and contacts list in order to be ready to jump right into the job search process, should it be necessary. Revise the skills section of your resume to reflect your value as an employee in the current workplace. Take a related-field class to bring you up to speed with the latest developments in your industry and buff up your communication skills in order to make yourself more marketable. From a financial standpoint, begin to pare down your unessential expenditures and delay major purchases until your employment status is assured. 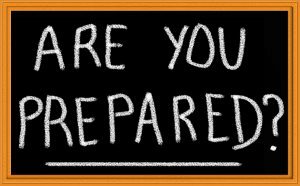 Knowing that you are as prepared as you can be will help ease the stress involved with the layoff process. And being financially responsible ensures that the bare essentials will be provided and you won’t fall behind on your other financial obligations. Once you’ve done all you can to prepare for potential unemployment, it’s time to focus on ways to keep your current job. While the stress levels among you and your coworkers will be very high and people will inevitably begin predicting who will and will not make the cut, it is important to stay out of the gossip mill and away from negative conversations. Participating in such behavior is both anxiety inducing and detrimental to your job performance. At this point, it is crucial to remain neutral and committed to performing your job the best you can because there is no better time to prove your merit than right now. In fact, about the best thing you can do to reduce stress and prove your value is to keep daily operations running smoothly. Meet deadlines, arrive to work on time and do not leave earlier, volunteer for projects and make sure your boss knows about your accomplishments. This isn’t a matter of tooting your own horn, it is a matter of proving to your employer that you are worth your salary and consistently work to improve your company’s profitability. During layoffs, you do not have control over a number of factors that affect your life, but you can ensure that you are prepared for any outcome and that your employer understands what would be lost in the event of letting you go.